Published on December 3, 2013 in Crime in T&T, General T&T, Law, Media, Police and Violence. Closed Tags: Abuse, Crime in T&T, Newsday. THE SLAUGHTER of the innocent continues. For the third time in less than three weeks evidence has surfaced that a child has been beaten to death. 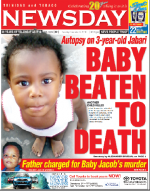 The latest innocent baby to lose his life is three-year-old Jabari Hernandez of Carmichael Village, Coryal, East Trinidad. Young Jabari died on Saturday afternoon after he was reportedly seen vomiting at his home. At the time, it was believed the child may have died from injuries sustained in a fall he reportedly suffered at home a week prior to his death.